As Arrests Mount, Venezuela's Opposition Struggles To Find A Way Forward : The Two-Way The country's high court ordered the arrest of Ramon Muchacho, a mayor who is part of the opposition. Anti-Maduro groups are weighing what to do next — and some fear violence is on the table. 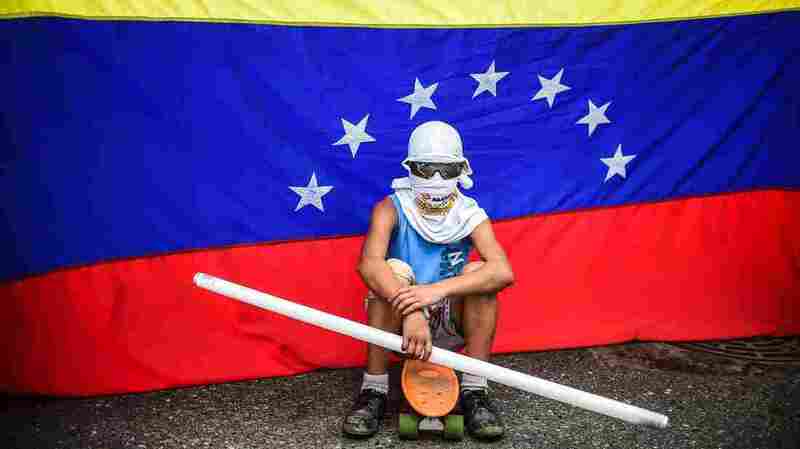 An opposition activist sits in front of a Venezuelan flag during a protest against the constituent assembly in Caracas last week. Opponents of President Nicolas Maduro have struggled to find a foothold in their struggle against his consolidation of power. Venezuela's highest court has ordered the arrest of a mayor allied with the opposition to President Nicolas Maduro. The order handed down Tuesday by the Supreme Court formally fired Ramon Muchacho, mayor of the capital's wealthiest district, Chacao, and sentenced him to 15 months in prison. The court, stacked with Maduro loyalists, criticized Muchacho for failing to ensure unrestricted transit in his district, which has been an epicenter of protests over the past four months. Since April 1, when mass protests broke out after the Supreme Court's abortive attempt to dissolve a legislature that is packed with opposition lawmakers, Chacao's major thoroughfares have clotted frequently with protester blockades and barricades. The court told him to remove those barricades; Muchacho refused. Ramon Muchacho, mayor of Chacao, speaks at a news conference in May. 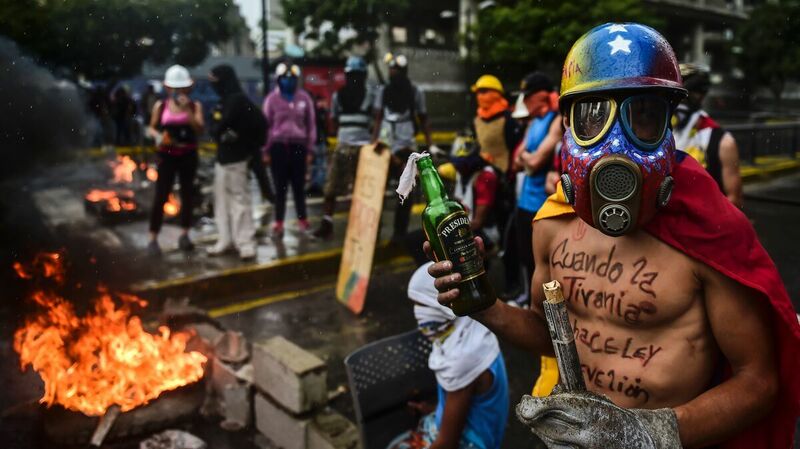 Muchacho was removed from his position Tuesday and sentenced to 15 months in prison by Venezuela's Supreme Court. 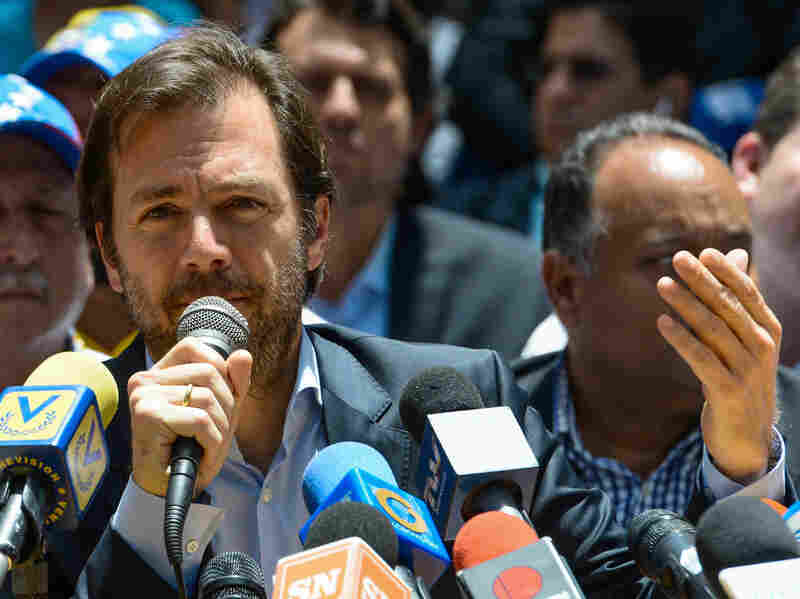 "We are being condemned for doing our job, for guaranteeing the legitimate right to peaceful protest and the right of all Venezuelans to exercise their civil and political rights," Muchacho wrote to supporters Tuesday morning. "The coming hours will be difficult for me." But Muchacho isn't the only opposition member to be punished by the Supreme Court recently. In the past several weeks — as Maduro's powerful National Constituent Assembly took shape in a disputed election and settled into its task of rewriting the country's constitution — The Associated Press reports the court has ordered the arrests of three other opposition mayors. That includes David Smolansky, mayor of nearby El Hatillo, who was also charged with failing to disperse protests in his municipality. Muchacho's predecessor as mayor of Chacao, the high-profile opposition leader Leopoldo Lopez, remains under house arrest after briefly being removed from his home in a midnight raid. All of this has raised difficult questions for Maduro's opponents, who appear to be grappling with a set of diminishing options in their bid to loosen his ruling Socialist Party's tightening grip on power. Despite foreign pressure — including ejection from the Mercosur trade bloc and fresh U.S. sanctions — Maduro and his allies have shown no hesitation in plowing forward on their constitutional reforms. In fact, the National Constituent Assembly has already ousted a figure who has long been a thorn in Maduro's side: public prosecutor Luisa Ortega, an erstwhile ally who has become a vocal critic of the regime. And at a meeting Tuesday, the group formalized its extraordinary power, decreeing itself superior to all other government institutions — and effectively immunizing itself from any actions by the opposition-filled National Assembly. 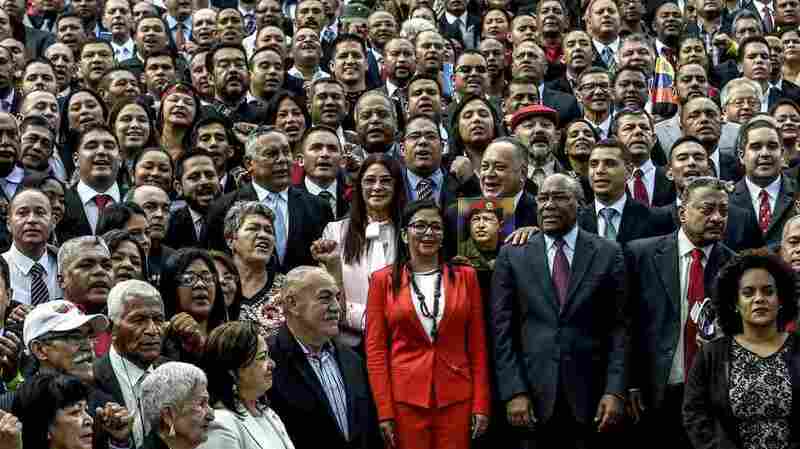 Members of the constituent assembly pose for the cameras during their inauguration last week in Caracas. The powerful group of delegates was called into existence by Venezuelan President Nicolas Maduro, who has tasked it with rewriting the country's constitution. As Reuters reports, the standoff now threatens to boil over into full-on armed conflict — a prospect possibly presaged by Sunday's attack on a military base in the northern city of Valencia. Some analysts say that incident, which Maduro called part of an "armed insurrection" against him, could indeed suggest the formation of rebel groups against the president. "As the government radicalizes," political analyst and pollster Luis Vicente Leon told the wire service, "these groups will tend to grow and the future could be full of conflict." That is not to say the recent past has been free of conflict. Opposition activists hold a fiery demonstration against the constituent assembly in Caracas on Friday, the day the legislative superbody was inaugurated. Onlookers fear the prospect of escalating violence as opposition activists' alternatives continue to diminish. In a statement released Tuesday, the United Nations condemned what it called the "widespread and systematic use of excessive force and arbitrary detentions against demonstrators in Venezuela." "Since the wave of demonstrations began in April, there has been a clear pattern of excessive force used against protesters. Several thousand people have been arbitrarily detained, many reportedly subjected to ill-treatment and even torture, while several hundred have been brought before military rather than civilian courts," Zeid Ra'ad Al Hussein, U.N. high commissioner for human rights, said in the statement. Citing roughly 135 interviews conducted remotely, the agency said that of the more than 120 people who have died in demonstrations over the past four months, security forces and pro-government groups are responsible for at least 73 deaths. The U.N. also notes that during that time, the government has arbitrarily detained more than 5,000 people. "And these patterns show no signs of abating," Zeid adds.